The Saint Paul Union Depot’s relation and importance to Minnesota and the upper Midwest has been likened to Ellis Island’s significance to America. In its prime years of the 1920’s, up to 300 trains per day operated out of the Depot on 20 platforms. The Depot was a hub for immigration, commerce, and mail and served as a focal point for the community. Recent renovations to the Depot, it is hoped, will restore some of that community focus as well as modern transportation functions. The project included a number of surprises and challenges beyond the average historical renovation project. Access to most of the site was limited during the first year due to ongoing US Postal service operations, and two of the three project years included Mississippi River flood levels that necessitated the construction of dikes and other measures to keep the river from inundating the project area. Excavation work for structural foundations and grading turned up a variety of historic artifacts as well as literally tons of “historic” construction debris -- the fill material of choice in the 1920’s. Some of the more interesting artifacts include shoes, medicine bottles, coffee cans, a conductor’s log book, and a souvenir cup with the Milwaukee Road’s logo. All artifacts were documented and placed in storage -- a few of these artifacts are on display at the Depot. 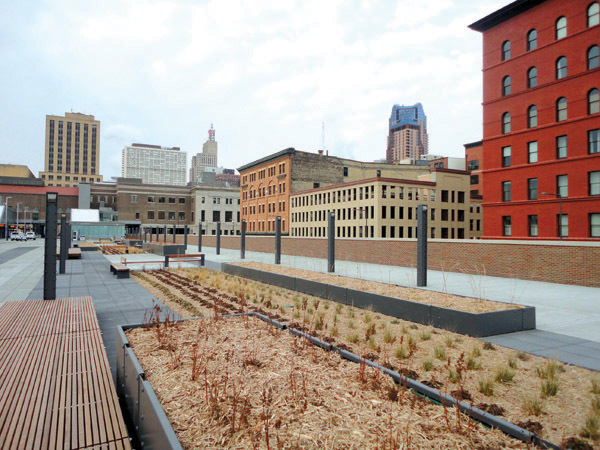 The project required a wide range of specialties to transform the 33-acre site from a defunct rail station to an active transportation center in the heart of the Lowertown neighborhood. On one end of the spectrum were historical paint curators examining existing paint fragments to determine original colors used in the Depot, on the other end were heavy equipment operators in Hazmat gear excavating and disposing of impacted soils. The range of activities was generally happening concurrently, making for extremely active and interesting construction site visits. The project required coordination of operations for passenger rail, freight rail, local bus, intercity bus, charter bus, LRT, taxis, limos (weddings), aircraft (St. Paul downtown airport), metro mobility, bicycles, private cars and steamboats as well as pedestrians of course -- extremely multi-modal! Several blocks of sidewalks adjacent to the depot site were expanded for pedestrian use and improved with decorative lighting, security systems, benches, and other amenities. The site plan included dedicating the northerly 20 feet of the train deck level (along Kellogg Boulevard) as a pedestrian and bike promenade that begins at the corner of Sibley Street/Kellogg Boulevard. The promenade extends over a new pedestrian bridge and down to the Mississippi River steamboat landing (there are several steamboat trips on the American Queen that depart from St. Paul) and will connect to the Bruce Vento Trail and Lafayette Bridge trail heads without ever crossing traffic. The promenade includes pocket parks for resting and taking in views of the Mississippi River and very active railroad operations in the vicinity (especially designed for engineer-bikers!). A new oval-shaped bus platform is included on the train deck where three rail platforms once stood. The bus platform includes real time bus schedule information signs, and space for over 20 buses to operate at a time including layovers and passenger operations. 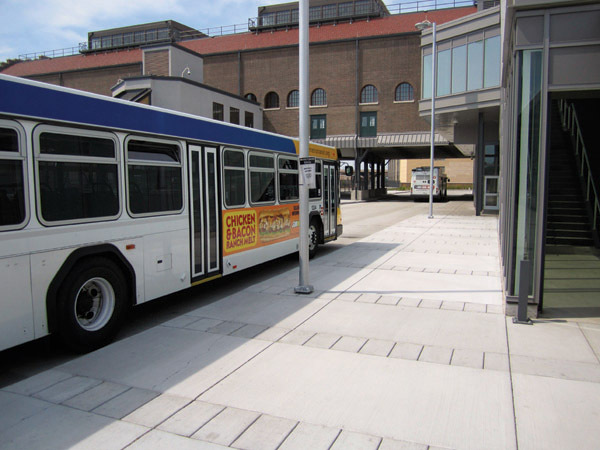 To enhance the convenience of bus passengers, the bus platform is designed to be accessible from the adjacent downtown street grid without needing to enter the Depot building. The passenger rail platform is situated at the southern end of the site to maximize the available platform length for Amtrak’s 1,700-foot-long Empire Builder cross-country trains. The Depot is designed to allow two Amtrak staff to safely and efficiently handle ticketing, baggage, train services (refuse, water, ice, food), as well as Amtrak freight operations, which the design team was surprised to learn. The renovated Depot incorporates a new full-service entrance along Kellogg Boulevard, which provides a more centrally-located building access as well as more efficient access for automobiles and taxis -- vehicles that were less common when the Depot was originally designed. Over 25,000 people attended the grand reopening of the Depot in December 2012. Amtrak service is anticipated to begin at the Depot in early 2014, and the Green line will begin arriving at the Depot in mid-2014. The Depot is designed and poised to handle additional LRT, commuter rail, and high-speed rail as systems become operational. 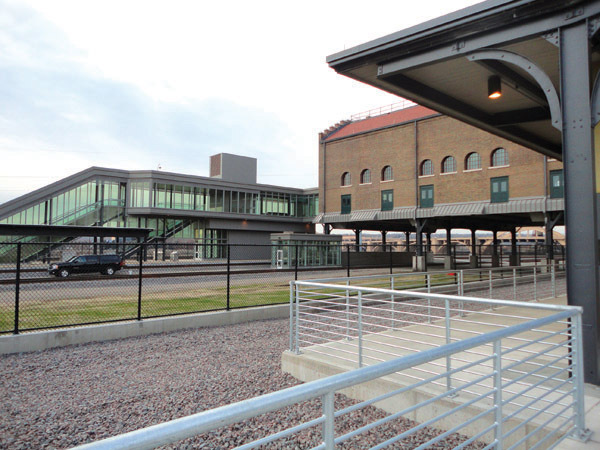 During the construction of the Union Depot, the Staint Paul Saint’s new ballpark was selected situated nearby, giving further credence to the significance of the renovated Depot and its amenities. Project success depended upon cooperation between agency stakeholders, multiple levels of government, and transit tenants and has resulted in the rebirth of a civic monument for the region. 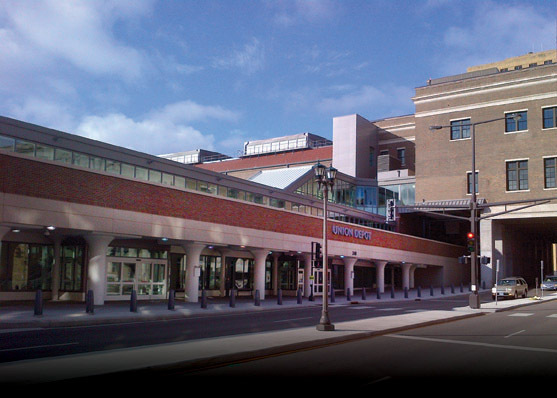 URS, the lead engineer, along with the Mortenson Construction team, was tasked with delivering the project for the Ramsey County Regional Rail Authority within three years of notice to proceed. Gregory Brown, PE, URS Corporation, was the engineer of record for Union Depot improvements. Carl Osberg, PE, URS Corporation, was the structural engineer lead for Union Depot improvements.